Christmas, Christmas Story, Mary Did You Know? Most know the Christmas story, but I am seeing it from a different viewpoint this year….Mary’ perspective. Now in the sixth month the angel Gabriel was sent from God to a city in Galilee called Nazareth, to a virgin engaged to a man whose name was Joseph, of the descendants of David; and the virgin’s name was Mary. And coming in, he said to her, “Greetings, favored one! The Lord is with you.” But she was very perplexed at this statement, and kept pondering what kind of salutation this was. The angel said to her, “Do not be afraid, Mary; for you have found favor with God. And behold, you will conceive in your womb and bear a son, and you shall name Him Jesus. He will be great and will be called the Son of the Most High; and the Lord God will give Him the throne of His father David; and He will reign over the house of Jacob forever, and His kingdom will have no end.” Mary said to the angel, “How can this be, since I am a virgin?” The angel answered and said to her, “The Holy Spirit will come upon you, and the power of the Most High will overshadow you; and for that reason the holy Child shall be called the Son of God. Even though the angel came to explain, what was to happen, can you imagine walking in Mary’s shoes and trying to make any sense of this unusual destiny that she was called to fulfill? Most individuals love it when God gives them confirmation, especially when He gives such an unusual assignment as He gave to Mary! Joseph was planning to send Mary away secretly when she told him she was pregnant, but then the angel of the Lord told him what she has said was true. Thankfully, not only was this assignment confirmed through Joseph, but confirmation also came through Mary’s relative Elizabeth. Even with two witnesses I cannot begin to imagine the exciting yet difficult path that Mary was commissioned to walk. Understanding this unusual conception was only the beginning. When it was time for delivery, Mary was again in a remarkable predicament. While traveling to register for the census, the time came to give birth. There was no room in the inn so she was forced to delivery baby Jesus in a stable and lay him in a manger. Read below this amazing story. 7 And she gave birth to her firstborn son; and she wrapped Him in cloths, and laid Him in a manger, because there was no room for them in the inn. 8 In the same region there were some shepherds staying out in the fields and keeping watch over their flock by night. 9 And an angel of the Lord suddenly stood before them, and the glory of the Lord shone around them; and they were terribly frightened. 10 But the angel said to them, “Do not be afraid; for behold, I bring you good news of great joy which will be for all the people; 11 for today in the city of David there has been born for you a Savior, who is Christ the Lord. 12 “This will be a sign for you: you will find a baby wrapped in cloths and lying in a manger.” 13 And suddenly there appeared with the angel a multitude of the heavenly host praising God and saying, 14 “Glory to God in the highest, And on earth peace among men with whom He is pleased.” 15 When the angels had gone away from them into heaven, the shepherds began saying to one another, “Let us go straight to Bethlehem then, and see this thing that has happened which the Lord has made known to us.” 16 So they came in a hurry and found their way to Mary and Joseph, and the baby as He lay in the manger. 17 When they had seen this, they made known the statement which had been told them about this Child. 18 And all who heard it wondered at the things which were told them by the shepherds. 19 But Mary treasured all these things, pondering them in her heart. Mary wasn’t able to return to her home because her life was now dictated by the destiny of the child she bore. We don’t read much more about their unusual lives until Jesus was twelve. His family traveled to Jerusalem for Passover. His parents realized He was not in the group on the way home. 46 Then, after three days they found Him in the temple, sitting in the midst of the teachers, both listening to them and asking them questions. 47 And all who heard Him were amazed at His understanding and His answers. 48 When they saw Him, they were astonished; and His mother said to Him, “Son, why have You treated us this way? Behold, Your father and I have been anxiously looking for You.” 49 And He said to them, “Why is it that you were looking for Me? Did you not know that I had to be in My Father’s house?” 50 But they did not understand the statement which He had made to them. 51 And He went down with them and came to Nazareth, and He continued in subjection to them; and His mother treasured all these things in her heart. “Mary did you know that your baby boy will give sight to a blind man? Mary did you know that your baby boy will calm a storm with his hand? Did you know that your baby boy has walked where angels trod? And when you kiss your little baby, you have kissed the face of God. Mary was the one who encouraged Jesus to perform His first miracle, turning water into wine (John 2:1-11). She must have been so proud as she observed Him heal the sick, multiply food for thousands, and raise the dead. She must have felt such concern when she watched as He was rejected, ridiculed, and falsely accused. Eventually she finds herself at the foot of the cross (John 19:25-27). He was making sure she was taken care of when He was gone. Jesus was resurrected three days later, but not long after He ascended into heaven. Jesus fulfilled the mandate He was given on this earth, yet I am sure Mary missed her Son. She pondered many things in her heart during His lifetime….now I expect her heart felt the pain of loss. Mary was an amazing woman. She walked a difficult path, but one that benefited us all. She went where none had gone before. Where would we be if she had refused? During the Christmas season, we celebrate the glory of God that came to us first through a baby and now exist among us in the form of the Holy Spirit. This glory enables us to walk the path that God created for each of us to travel. Between the prediction and the fulfillment of the promise, there is a process. Any time you are pregnant with promise you have a process! I am sure that when that angel first visited Mary she had no idea the process she would walk through, yet where would we be had she not been faithful to the assignment? I don’t know where you are in the process, but just as Mary had a destiny to fulfill, so do we! Wherever you are in the process you can be strengthened and encouraged in His presence and by the example that we have seen through the life of Mary. My Christmas blessing to you is that you will receive encouragement today to complete all of your assignments and that the Glory of the Lord will shine through you brightly during this wonderful season and into next year. Even though the angel came to explain what was to happen, can you imagine walking in Mary’s shoes and trying to make any sense of this unusual destiny that she was to fulfill? Thankfully, confirmation came in two ways. First the angel also explained what was to happen to Joseph (Matthew 1:18-25), and secondly, the Holy Spirit revealed it to her relative Elizabeth (Luke 1:36-45). Even with two witnesses I cannot begin to imagine the difficult path that Mary was commissioned to walk. Understanding this unusual conception was only the beginning. The next challenge Mary was faced with was the need to go into hiding because Herod wanted this child destroyed (Matthew 2:13-23). Mary wasn’t able to return to her home because her life was now dictated by the destiny of the child she bore. And He went down with them and came to Nazareth, and He continued in subjection to them; and His mother treasured all these things in her heart. Mary was the one who encouraged Jesus to perform His first miracle (John 2:1-11). She must have been so proud as she observed Him heal the sick, multiply food for thousands, and raise the dead. She must have felt such concern when He was rejected, ridiculed, and falsely accused. Eventually she finds herself at the foot of the cross (John 19:25-27). Mary did you know your son Jesus was born to die? Can you even imagine a mother’s heart breaking in this moment? This innocent Son suffered unbelievable agony and died for all humanity, so we might have eternal life. Jesus was resurrected three days later, but not long after He ascended into heaven. Jesus fulfilled the mandate He was given on this earth, yet I am sure Mary missed her Son. During the Christmas season, we celebrate the glory of God that came to us first through a baby and now exists among us in the form of the Holy Spirit. This glory enables us to walk the path that God created for each of us to travel. At times, our human strength is gone and our willingness to persevere the challenges life brings wears thin. However, just as Mary had a destiny to fulfill, so do we. My Christmas blessing to you is that you will receive encouragement today to complete all of your assignments and that the Glory of the Lord will shine through you. This morning during a time of prayer, I heard a powerful Word from the Lord and I have shared it with you below. I pray it will encourage you to do as Mary did and go where others have not gone before. Merry Christmas! “I have said it before, and I will say it again – CONTEND! Contend for My glory, contend for My presence, says the Lord. It is in My presence that you will find your strength for the fight. It is in My glory that you are equipped for the night. My power is in sight. It is available to help you overcome the plots to destroy your might. Look up! Look out! The destination is still in front and not behind. Push out of the places where you are stuck in the mud. No more excuses. No more delays. My power and anointing is available TODAY! 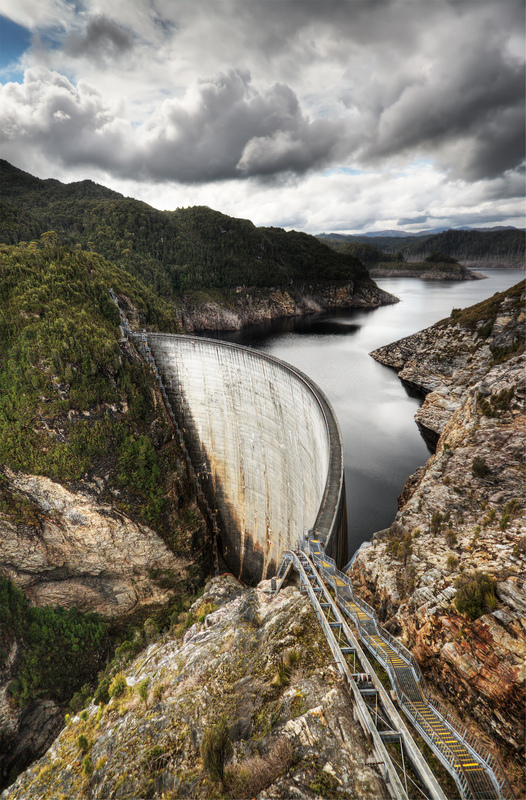 View from the Dam – Perspective is Everything! The vision I am about to share about the view from the dam, was a total perspective shift for me. I realized that where the enemy is attacking is the very place God was about to move! Have you been going through a time of discouragement or disillusionment? Have you been under major enemy attack? Do you feel like you have cried enough tears to fill a bucket? Then keep on reading this excerpt from my book, Road to Transformation. If you see a glass with some water in it, would you say it is half-full or half-empty? Both are actually true, but it’s your personal perspective which drives your unique response. Some people tend to see the big picture; others focus on the details. Maybe you have heard it described as the forest and the trees. Some people see the forest but miss the trees; others see the trees and miss the forest. Spiritual perception is critical, especially in the times we are currently living in. One thing that can greatly affect your perspective is spiritual warfare or enemy attack. To explain this concept, I would like to share a vision the Lord gave me. The first part of the vision happened during a Sunday morning service at our church. I was on the platform singing with the praise team. The line in the song that we kept singing said, “Something’s moving, something’s changing…” I saw a picture of a huge grey cinderblock wall. It was a close-up view, which did not allow me to see the top, or the sides. I could see the mortar between the blocks and what I thought were small cracks forming in the mortar. I began to pray about a shift I felt this represented in the Spirit, while worship continued. It is difficult to articulate, because it was a quick picture in my mind, but what I felt in my Spirit was huge. At this point in the service, our Pastor came to the platform and began to declare to the congregation that there was a shift happening in the spirit realm. It was great confirmation for what I had just experienced. After service, I described to my Pastor what I had seen. He told me that he felt there was more to come, and he would pray with me for God to reveal the rest of the vision. That evening our congregation was invited to attend a special service at a sister church. The minister preached a message that greatly impacted me. When considering all the great examples of faith listed in Hebrews 11, I had never contemplated what is said about Joseph in verse 22. He provided instruction to his family that they were to take his bones with them when they went to the Promised Land. The minister said that Joseph’s bones represented vision and he shared three lessons from Joseph’s bones: 1) God always comes through on His Word. If He said it, it will happen! 2) A promise delayed is not a promise destroyed or denied. 3) Once you catch a glimpse of the Promised Land, you will never be content to live in Egypt! This message was to encourage those who were ready to give up on their vision. The next morning, I arose early as usual, to have my personal devotion time with the Lord. I began to write in my journal about what had happened the previous day. I described the vision I had seen on the platform and the highlights of the message from the evening service. I wrote that I was aware the previous day’s activities were a setup from God to help me change my perspective and focus on the destiny again. However, the reality was that my circumstances had not changed, and I could not understand how my current life was to intersect with the life I once thought I was called to live. I wrote that I felt the lines were blurred and I could not clearly see or define what God’s actual promise versus my own hopes and dreams were! I continued writing about my prayer from the previous night, “Lord if You really save my tears in a bottle, have You switched to a bucket yet?” At that moment, the vision that began the preceding day continued! Instantly I was standing in front of that cinderblock wall. This time I saw the whole wall, but it was so huge, I still could not see over it or around it. It felt like such a dry and desolate place. Then I noticed the mortar was turning a darker grey color in between the blocks resulting from moisture. Suddenly, I was taken up high and was now looking down at the wall from an aerial view. I discovered that it was not simply a wall, but it was actually a dam! Behind the dam’s wall was an enormous amount of water, which I knew was a direct result of every tear, prayer, praise, and sacrifice. It was more than a bottle or a bucket. The dam was full and pressing against the wall. The view from the dam in this vision was a total perspective shift for me. I realized that where the enemy is attacking is the very place God was about to move if I would just keep fighting! Unfortunately, this is where many quit; right before the breakthrough. We have a real enemy, and his number one goal is to kill, steal, and destroy God’s children. If we are in opposition to the enemy’s plan, we will be in a battle as long as we are on this earth. It is very easy to allow the battle to become our focus, but God allowed me to see in this vision what was happening as a result of the battle. My perspective changed instantly when I realized that every stroke and kick in my fight was causing the water to rise higher and higher. Additionally, the higher level was the increasing force and capacity of the river! Greater meaning came from the fact that the Lord pointed out that my battle in the water was not just a mode of survival during a storm, but a purposeful fight. The contrast between a wall and a dam is significant. A cinderblock wall gives the idea of a dead end or an obstacle. A dam however, obstructs and controls the flow of water while creating a reservoir. A dam is a great source of power when its floodgates are opened. The greater the reservoir, the greater the power when it is released. The enemy intends to obstruct and control the flow of God’s power, but what he fails to realize is with every obstruction the reservoir is enlarging. The larger the capacity, the greater the power when released! The greater the battle… the greater the breakthrough! Be encouraged today!